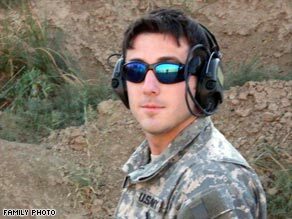 KBR denies responsibility; soldier's mother "pleased"
WASHINGTON (CNN) -- A Green Beret sergeant was electrocuted in Iraq in 2008 because of failures by the U.S. military and a major defense contractor, which did not properly ground and inspect electrical equipment, according to a Pentagon report out Monday. Nine of 18 electrocution deaths reported in Iraq were caused by "improper grounding or faulty equipment," including the January 2008 death of Staff Sgt. Ryan Maseth, the Defense Department's inspector-general found. Investigations remain open in five of those cases, according to a summary of the report obtained by CNN. The new report concluded that "multiple systems and organizations failed," leaving Maseth "exposed to unacceptable risk." The decorated soldier from Pittsburgh, Pennsylvania, was electrocuted in a shower at a U.S. base in Baghdad that once served as one of Saddam Hussein's palaces. The report found that a water pump installed by military contractor KBR was not grounded, leading to Maseth's electrocution when it short-circuited. It found that Maseth's commanders failed to ensure that renovations to the palace had been properly done, the Army did not set standards for jobs or contractors, and KBR did not ground electrical equipment it installed at the facility. The Houston, Texas-based company has defended its performance in the war zone from extensive criticism by Congress and has argued that it was not to blame for any fatalities. In a statement issued Monday afternoon, it said it had not seen the Pentagon report and would not comment. "While the death of Staff Sgt. Maseth was tragic, KBR continues to maintain that it was not responsible for his death," company spokeswoman Heather Browne said. "The building in which Staff Sgt. Maseth lived was built by Iraqi and other contractors under the previous Iraqi leadership." Brown said the building, "like many other pre-existing buildings in Iraq, had not been grounded or bonded by the contractors who built the structure," and she said KBR had warned the military about the hazard nine months before Maseth died. "Prior to that incident, the military never directed KBR to repair, upgrade or improve the grounding system in the building in which Maseth resided, nor was KBR directed to perform any preventive maintenance at this facility," Browne said. But Maseth's mother, who has filed suit against KBR in her son's death, said she was "pleased" by the findings. "The results are revealing and contrary to what KBR and its president have continuously stated over the past year," Cheryl Harris said. "On that note, the DOD IG report states that KBR installed the water pump that killed my son, a point that KBR has flatly denied over the past year." Maseth's death led to congressional hearings in 2008 and demands for a full investigation by the military, which resulted in the report out Monday. Pennsylvania Sen. Bob Casey, who pushed for the investigation, said Monday's report should not be the end of the process. "We cannot stop with the publication of this report alone," the Democrat said in a written statement. "Those who failed to carry out their contractual obligations in a way that contributed to the death of a U.S. soldier should be held fully accountable for their negligence." Another report is being prepared by the Army's Criminal Investigation Division, Casey said. Maseth's family and that of Christopher Everett, another soldier mentioned in the report, have sued KBR over their deaths. Everett, an Army sergeant, was electrocuted in 2005 while using a power washer at an American base outside Ramadi. Other deaths the inspector-general's report found were caused by faulty electrical equipment or improper grounding include the death of Army Spc. Marvin Campo-Siles in April 2004 in Samarra; Spc. Chase Whitham, May 2004, in Mosul; Spc. Marcus Nolasco, also May 2004, in Baiji; Marine Pfc. Brian Cutter, in Fallujah, the same month; Navy Hospital Corpsman 3rd Class David Cedergren, killed in Iskandariya in September 2004; Sgt. Michael Montpetit, who died in Baghdad in June 2007; and Sohan Singh, a private contractor killed in Fallujah in July 2005. In March, a top Army inspector said that thousands of buildings on U.S. bases in Iraq and Afghanistan have such poorly installed wiring that American troops face life-threatening risks. Jim Childs, a master electrician and the top civilian expert in an Army safety survey, said problems were "everywhere" in Iraq, where 18 U.S. troops have died by electrocution since 2003. The nine electrocutions not caused by faulty grounding were caused by other electrical accidents, such as contact with live power lines.